In a series of providing practice questions for IBPS PO exam, today I am providing two practice sets appeared in IBPS PO III. Study the bar-chart and pie-chart carefully to answer the given questions. 1) What is the difference between the number of working females in Bangalore and the number of working males in Chennai? 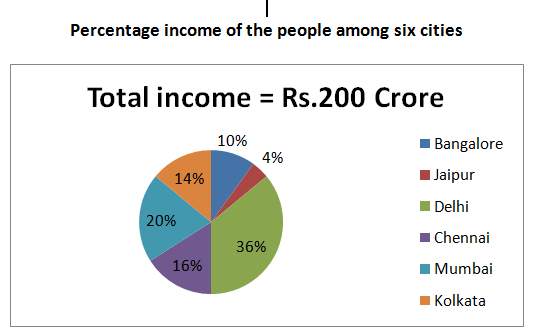 2) In which city is the income per working person the minimum? 3) What is the sum of the average working male and average working female population of the given six cities (calculate approximate value)? 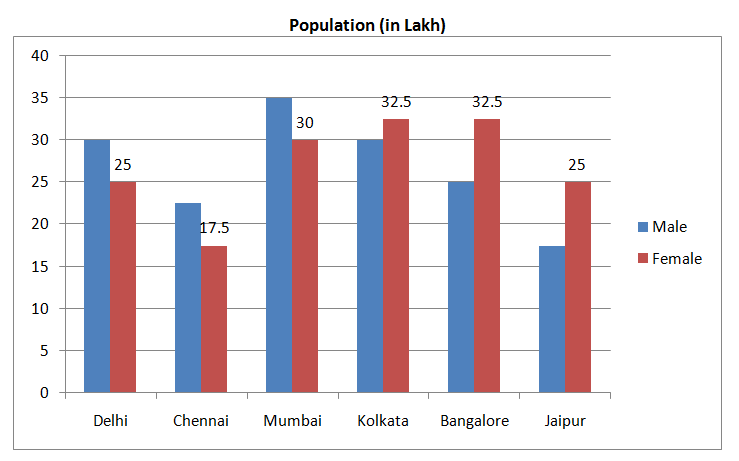 5) The number of working females in Mumbai is what percent of the number of working males in Bangalore? Study the given bar-chart carefully and answer the following questions. The graph shows the number of villages in fouir different states where electrification was done in different years. 6) The number of villages in Nagaland where electrification was done in 2013 is what percentage of the number of villages in Tripura where electrification was done in 2014? 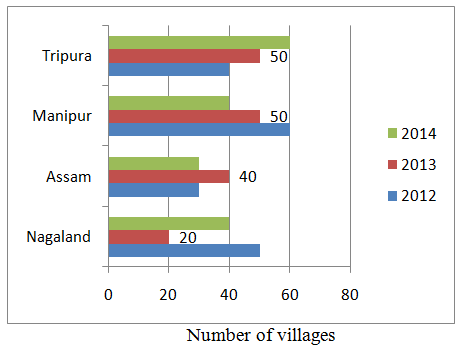 7) What is the ratio of the villages in Assam to those in Manipur where electrification was done in 2013? 8) In which state was the electrification work done in maximum villages during the given three years? 9) If the cost of electrification of a village is Rs.75 lakh then what is the cost of electrification in four states during the given period? 10) In which year was the electrification work done in maximum number of villages? The income per working person in Jaipur is the minimum. So, maximum electrification in both Tripura and Manipur. In 2012 maximum electrification work was done. when is ssc-cgl 2014 tier-1 exam ? raman bhai kuch toh update dijiye .. hum log ko jawab aapko hi dena padega. waitng waitng .. reseve list me jo shortlistd nahi hain what vl happn 2 them? can you tell me how to solve this? sun is red, red is yellow,yellow is blue,blue is sun.what is the colour of sun.sorry i donot remember exact question.so tell me how to solve this type of question. How can you solve it? Please tell me more how to solve this type of question. sir,i have comlepted my graduation this year and about to appear for PO-IV exam.I am from general category. out of 200 marks in CWE how many marks is safe for getting a call for interview as i am practising and getting 110-120 out of 200 in mock tests by various institutes . should i prepare for more ? My top choices for bank are PNB/BOB/BOI/UBI. do i need to practice more ? i am confused sir .